You can choose to sell items and also register to HELP OUT at the sale to shop early, too! Gather your items together, prep them (using these handy guidelines) and create your tags using our online tagging system. We've got helpful videos for you, too! Bring your tagged items, ready to go! If you want to donate anything that doesn't sell, you're done! If you want to pick up unsold items, see times for that too. and 14 days later, your check gets emailed to you! Earn up to 70% on your sold items! JBF of Greater Palm Beach Consignors earn 60% less a $15.00 consignor fee per sales event. Consignors who are able to help during (or before) the sale for at least 4 hours earn 70%. Volunteers that help for the breakdown shift also get their consignor fee WAIVED! First come first serve for this offer. Consignors earn an average of $300 at each sale! Join our Team! Many helpers are needed to make each sales event the perfect place for families to find great deals on items they need! PLUS, earn an extra 10% of your consigned items. Consignors and Volunteers get to shop FIRST! ​Tip #1 If you can't help out yourself, you can sign up for a shift and have a family member/friend fulfill it for you. Make sure they sign in/out using your consignor number s you get credit! Tip # 2 Keep your eye out for *BONUS shifts as you will receive credit for more hours than you actually help, allowing you to quickly earn Team Member benefits. Tip #3 You may divide your four, eight or 12 hours into more than one shift and they do not need to be worked on the same day or by the same person...we love responsible teenagers, husbands and grandmothers! We always need a few guys (yes, they can join the team for your EARLY SHOPPING PASS....(or you can both work 4 hours together and get more credit) to help with set up and/or breakdown. We would also love to have some muscle to help shoppers with loading bulkier items to their cars during the sale. ​C​heckout: Team member scans tag as shoppers check-out and counts the number of tags. If you can count to 50, you're perfect for this job! Sales Floor: Team members will float the sales floor, checking for dropped items, missing tags, straightening clothing on racks and tables, or hanging up items that weren't purchased. If you can move from section to section, spot a potential mess of items and make them look awesome, this would be a great job for you! Greeter: Team member will great customers at the door, tag personal strollers and carriers, check for appropriate presale passes, and direct shoppers to various areas for shopping. If you can talk, smile and be friendly to others, this job would be a super fit for you! Jack-of-all-Trades: If you can do any or all of the above, then we have hit the jackpot! Sometimes, we may need you in one position and then switch you to another as shifts and number of shoppers change. Working at a JBF sale is so much fun and we always need your help! Please sign up for as many shifts as you can comfortably work! Breakdown: help sort items for consignor pick up as well as help breakdown the event and supplies. Final Dropoff, Friday May 17, 2019 from 7:00PM to 8:30PM. Drop off is ONLY for that 90 minute period. If you are planning to participate in final drop off, you must unload and drop off within those times. 1.Unload your items and bring them into the store. Once inside we have rolling racks available on a first come, first serve basis that you can transfer your items onto for inspection and putting out on the sales floor. We recommend having your items sorted when brining them to make your drop off process smoother. Clothes together in size and gender. Similar toys together, etc. 2.Once inside, get your checked in sticker, show your drop off pass & waiver and head out to the floor with your items. 3. Any baby gear or equipment? Check in with our recall specialist when putting those items out on the floor so she can check them for recalls first. 5. Inspection will take place after you drop off. All items pulled for rejection will be scanned & marked. If you are donating, they will be donated to our charity partners. If you are picking up, they will be sorted with your unsold items. 6. Your presale passes will be given to you at drop off and before the presale shopping starts. **Selling 300+ items? Send an email to SamoneGibson@jbfsale.com to sign up for a drop off appointment! Pick up for all Consignors: Sunday, May 19, 2019 from 8:00pm-9:30pm at the Burns Road Recreation Center. At 9:31pm remaining items are donated to our charity partners. Sorry, no exceptions! 1.Check in with the greeter and get a consignor pick up form. 2. pick up team member will then guide you to all items that will be sorted into consignor #. Make sure you bring your consignor # with you to pick up. Diaper bags, infant carriers, backpacks, and purses are great consignment items. Please inspect all items carefully to make sure items have not been recalled, stained, damages or are missing pieces. Package: Please zip-tie items to an adult-size hanger. If you have higher priced items (over $25) please let us know at Drop Off for assistance. Price: Price 50%-75% off retail. Items in great condition tend to sell very well! Tag: Hole-punch JBF tag and attach it to the item with ribbon or string. If item contains multiple pieces, be sure all pieces are included and list number of items on JBF tag description. Bedding sizes accepted are bassinet through twin ONLY! Please be selective when selling bedding, blankets, receiving blankets, burp cloths and towels. New and barely used items sell best. Check carefully for stains; shoppers get very disappointed if they find a stain in a bundled blanket once they get home. Package: Put bedding/crib/bedroom sets together in original packaging or giant clear plastic bags. Arrange bedding sets inside bag so that shoppers can see all of the items as well as the design/pattern. Secure the bag so that items do not get seperated. Bundle blankets, clothes and towels with ribbon or string like a package (be sure multiple pieces cannot be seperated) unless you are selling them seperately. Tag: If bedding is in a plastic bag, attach tag securely with packaging tape to the inside of the bag and tape the bag shut (bedding set prices vary widely and securing tags inside prevents tag switching). If bedding/blankets are bundles with string, attach tag directly to blanket and tuck it under the ribbon so that it does not easily get pulled off when shifting around during the sale. Books, book sets, board games, puzzles, video game systems, scrapbook, arts & crafts sets are great items for resale. Please only bring kids' parenting, homeschooling, pregnancy and child rearing books. Adult novels are not accepted. Games and puzzles must have all pieces. Check items to ensure they are in great condition. Package: Use clear, self seal bags or clear cling wrap (saran wrap) to hold multiple items together; Tie sets of books together with ribbon. Be sure that parts/games to video game systems (such as Vtech) cannot be separated or switched out at the sale. Tag: When tagging books, please attach your tag to the book with clear tape that can be removed without damaging the item. Tape tag to the outside cover of glossy books and to the inside cover of paper books as to not tear when removing the tag. Please do not use masking tape or double sided tape. Hole punch JBF tag and tie to sets. We sell children's clothing Newborn through size 20 (limit 20 girl's junior size items, Abercrombie, Hollister, Roxy, American Eagle, Nike, Volcom, Burton preferred) as well as maternity sizes (limit 20 maternity clothing items per consignor). Our Fall Sale is an all season event. Be picky. Look at your clothing items as if you were going to purchase them. No stains or damaged items will be accepted. Any items that look like "mom's" clothes will be rejected at inspection. Please freshly clean your clothing items. ​Replace missing buttons, sew loose seams, and clip loose threads. Please button all buttons, snap all snaps, zip all zippers before you arrive at Drop Off. This will ensure that there are no defects in the clothing. The new the item looks (and the better it smells), the better it will sell. Package & Hang: Hangers - Please hang clothes so the hanger hook points to the left (like a question mark). Hang size 0-6 clothing on child-size hangers and sizes 7-20 and maternity clothin on adult-size hangers. Clothing that falls off the hanger onto the floor does not sell well. Exersaucers, swings, high chairs, changing tables, cribs (Manufactured AFTER June 28, 2011; please bring Crib Waiver for all cribs), strollers, bath seats, baby walkers, car seats & car seat accessories must be checked for safety recalls, must have all parts, and be in good condition. Children's furniture - beds (toddler, twin), desks, side tables, dressers, etc. Price 50% - 75% off retail. Items in great condition tend to sell very well. Select: Nursing covers & pillows, feeding items, monitors, safety items, diapering & toileting items, rattles, and more. Please check for safety recalls on all items that you consign. Select: Household items that other families will use (no knick knacks please). You may consign storage solutions (baskets, bin, shelving), furniture (no upholstered items), decor (lamps, wall hangings, no antiques), and kitchen items (small appliances, utensils, etc.). We are narrowing this section a great deal! No more toiletries, knick-knacks, flea market finds, dated picture frames or gifts, strings of Christmas lights or outdated Christmas decorations! This sections is for MOMS! Price: Price to sell! These items are not the primary reason shoppers come to JBF, so the price low! Select: Ride-on toys, block sets, dolls, remote control cars, outdoor toys, learning toys, and more. All toys must be checked for safety recalls before consigning. Clean all toys and baby equipment thoroughly. Please test to make sure that toys and equipment are working properly. Battery operated toys must include working batteries (these can be purchased inexpensively at local discount stores). Select: Make sure that the shoes are clean, clean, clean! We will be VERY selective with shoes during Consignor Drop Off & Inspection. 1. Do you have at least 100 items? ​3. If Valet Tagging were not an option, would it be impossible for you to participate in the next JBF Sales Event? The JBF Valet Tagging Service is the perfect solution for busy moms who don't have the time to prep and tag their children's outgrown items! Our top-notch taggers do all the work and you get a nice check two weeks after the event!! If you don’t have the time to prepare and tag your kids’ stuff, call or email us and a Valet Tagging Team Leader will be in touch with you to see how we can best serve you. Depending upon the level of service you desire, our Team can take your items and hang, price, tag and drop-off everything at the sale for you. After the sale is over, you can either pick-up any unsold items or donate them to our children’s charity! To reserve your Valet Tagging spot at our next sale, contact Lindsey at VIPTaggerSoFl@gmail.com (usually within four to six weeks of the next sale). Space is limited, so make sure to confirm your participation early. We will then send you a Valet Consignor Waiver and ask that you complete a questionnaire. We provide cardstock, tags, tape, tagging guns, hangers, etc. If an item requires batteries, you will be charged only the cost of the batteries (and only if needed), since all sale items are required to be in working order at drop-off. We also need to know if unsold items will be picked-up by you or donated to charity. Your Valet Tagger will enter all tag information into the myjbftags.com barcode system, using your JBF Universal Consignor Number. Your Valet Tagger will price your items according to a general pricing guideline, which is based on 1/4 to 1/3 of the original retail prices of your items. NOTE: No changes (to prices, reduced/not reduced, donated/not donated, etc.) can be made after tags are printed. The Valet Tagger will drop-off your items at the JBF sale (if desired). You will be able to view your sales (as they are uploaded) by logging into your My JBF Profile and then myjbftags.com account. After the sale, you can either show up at consignor pick-up (the date/time can be found on our event calendar) to retrieve any unsold items or do nothing and your unsold items will be donated to charity. After you receive your check, please print off a tax deduction for your donation by going to myjbftags.com and clicking on “reports” and then “list of items.” You will choose “unsold/donated items” and then “print” for a list of the items you donated to charity. Hi, I'm Samone Gibson. My husband Brandon and I organize the JBF sale in Pembroke Pines/Miramar. We are now excited to bring JBF back to Greater Palm Beach community this Spring! Starting this business was a "heart" decision for me. We all know that our children are priceless, but clothing them does not have to be. The events allow local families to sell the items their kids no longer use, but have plenty of life in them. 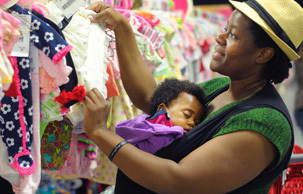 Families earn cash and then outfit their children with their next size for less money. This on one of the many reasons I love Just Between Friends...I know you will too. You are welcome to take a look around! You don’t have to “join” to access our information. But we’d love for you to sign up with us so we can keep you up to date on our latest sales news as well as any great saving information. Just use the links in the upper right hand corner to signup today! It’s FREE!